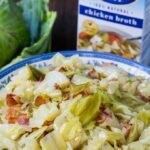 Southern Cabbage is an easy southern side that goes great with chicken and pork and makes a wonderful addition to a holiday meal. 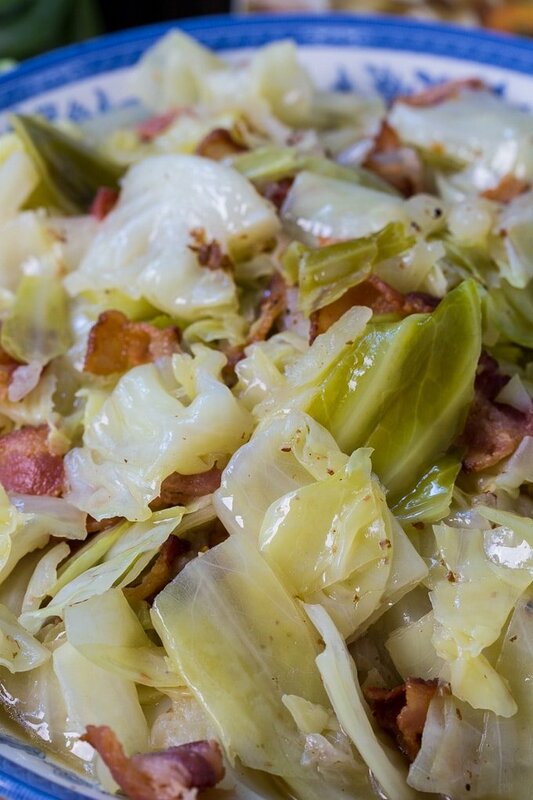 Cabbage is slow cooked until tender in chicken broth flavored with bacon and onion, plus a few red pepper flakes if you want some heat. Southern Cabbage is one of my very favorite foods ever so I enjoy making it even outside of the holiday season. It is supposed to be a side, but to me it’s a main dish because whenever I make it or see it on a buffet, it’s the only thing I want. I think most cabbage lovers can relate. This recipe is easy to make and convenient- only 3 ingredients plus a few seasonings are needed. As the cabbage simmers, the chicken broth reduces, concentrating its flavor. It tastes so goody’all, I eat the cabbage first and then drink every bit of the broth. It’s the best part. You can either slurp it up or sop it up with a piece of cornbread. 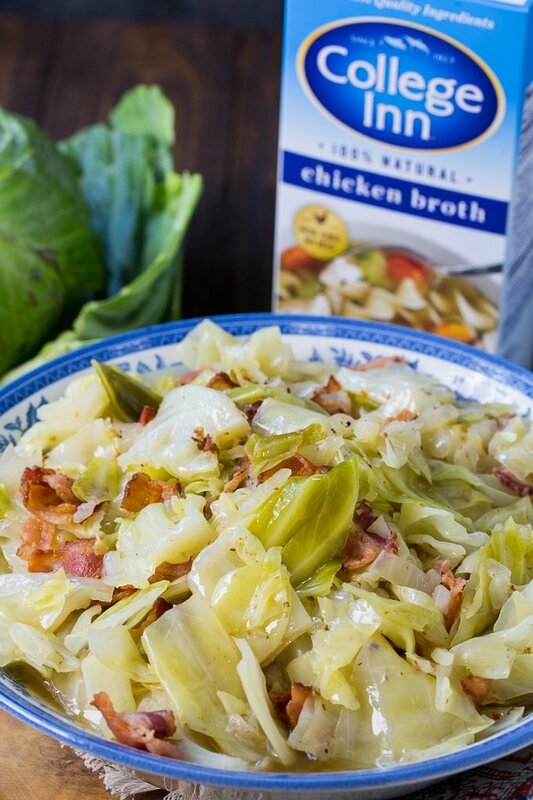 There’s no better way to cook cabbage than to simmer it in chicken broth with onion and bacon. 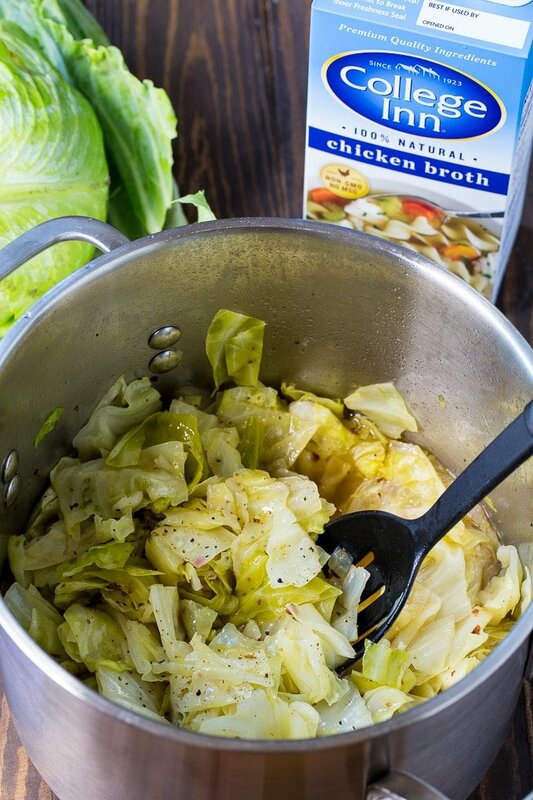 The cabbage cooks up soft and tender with all of the awesome flavor of the chicken broth and the cabbage adds flavor to the chicken broth as well. It’s a totally symbiotic relationship. Since most of the flavor of this recipe is coming from the chicken broth, you really need to use a quality one. I choose College Inn Chicken Broth because they make a richer, deeper broth made from the finest all-natural chickens and farm-grown vegetables. College Inn broths are Non-GMO and contain no MSG. A long, slow simmer with flavorful herbs and spices creates a broth that helps make the ordinary special. 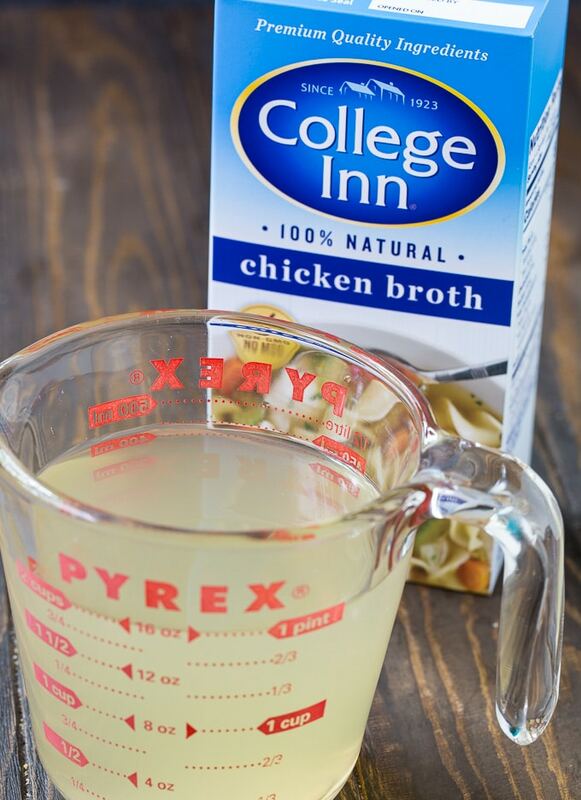 College Inn Broth has just the perfect flavor for making your dishes family favorites this upcoming holiday season and all year long. Note: The chicken broth, especially once it boils down some and the flavors concentrate, should add plenty of saltiness together with the bacon. But if you need to, salt to taste at the end. If you try out this recipe, I’d love to see! Be sure to use #CollegeInnBroth in social media. Southern Cabbage is an easy southern side. 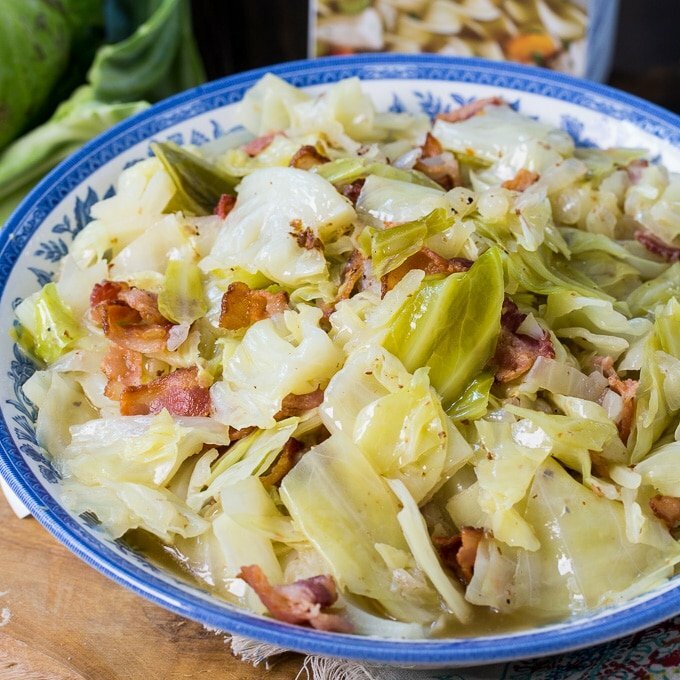 Cabbage is cooked until tender in chicken broth flavored with onion and bacon. Cook bacon in a large pot or Dutch oven until crispy. Remove bacon from pot and set aside. Leave about 2-3 tablespoons of bacon grease in the pot. You can save any excess bacon grease for another use. Cook the onion in the bacon grease until soft. Add cabbage, chicken broth, and red pepper flakes. Cover pot and simmer for about 10 minutes, opening it to stir once or twice. Remove lid from pot and cook uncovered for about 15 minutes. Turn up the heat a little so you get a good amount of evaporation. Season to taste with pepper. If desired, add a little salt. Crumble the bacon and mix it into the cabbage mixture. Serve in small bowls with with the broth. How much onion? It’s not listed in the ingredients. We love cabbage and I am interested in trying your version. I. Too, want to know how much onion. I gave up on seeing a reply, so I just used a medium sized yellow onion, chopped. The Cabbage was great. Thank you for sharing.